What is SHOFAR KRAKOW: Call to Return? When we sit down to our Seders tomorrow night, we should all take a moment to consider the date - April 19th. On this day, in 1943, the Warsaw Ghetto uprising began. It also happened to be the date of the first Seder, just as it is this year. Shortly before dawn on April 19, 1943, two thousand German troops entered the Warsaw Ghetto in an effort to liquidate it in honor of Hitler’s birthday, the following day, April 20. They were met by Jewish Guerillas, of the ZOB (The left-wing Jewish Combat Organization) and the ZZW (right-wing Jewish Military Union), armed with a meager, motley supply of ammunition, pistols, some rifles, one machine gun, and homemade bombs. Together, they fought back destroying a number of tanks and even killing some German troops. The German’s had intended to liquidate the Ghetto in three days and against all odds, the Jewish fighters managed to hold them off for nearly a month, until May 16, 1943, when the uprising tragically came to an end. These brave men and women knew that it was impossible that they would survive the uprising, yet they chose to take their fate into their own hands and fight as long and hard as they could. In the last moments of their lives, they were briefly granted that freedom we speak of at the Seder. They freely chose to die fighting, and many chose to die at their own hands and not by those of the oppressor. They chose not to be slaves to their fate. The ability to choose is what differentiate slaves from free people. Pesach is a holiday that epitomizes Jewish continuity. For thousands of years, families around the world have gathered around a table to tell the story of the Exodus. Here in Poland, and wherever you find yourselves this year, we will be sharing the same tale. This story survived our exile from Jerusalem, the Spanish Inquisition, and even the Holocaust. Through all these tragedies we have told the story of our difficulties, and our ultimate survival. In Krakow, we see this survival every day, and as over 200 people sit down to our Seder tomorrow night, we know that we aren’t merely surviving – we are thriving. Not all our stories of Jewish heroism end in victory. Moses bravely succeeded in leading his people out of Egypt, Mordechai Anielewicz knew he would never have the same success. Yet all these stories deserve to be retold. Tomorrow night, at your Seder take a moment to remember the brave souls of the Warsaw Ghetto uprising. Wishing you a Chag Pesach Kasher V’Samech! What brought you to Krakow and how did you end-up at the JCC? My name is Fayaz Ahmed from Pakistan. I have come to Krakow on a Double Degree Masters Program Clean Fossil & Alternative Fuels Energy (CFAFE) being funded by EIT InnoEnergy. One morning while having a walking tour of Jewish Quarter, our tour guide mentioned JCC Krakow and told us about its history and contributions to the revival of Jewish life in Krakow. Before coming to Krakow, I had never had a long interaction with Jewish people in person. All I knew about them was from Hollywood movies like Schindler's List and The Pianist. When I heard about volunteering opportunities for Shabbat Dinner at JCC Krakow, I made up my mind within no time to join JCC Krakow as a volunteer in order to get to know the Jewish community firsthand. Why did you decide to stay at the JCC? I still vividly remember the first Shabbat dinner I volunteered for. It was a much better experience than I had expected because it was a totally new community for me. I could literally see the sincere appreciation of my efforts reflected from the smiles on participants' faces while interacting with me. JCC Krakow is one big family that dines together, celebrates together, and smiles together, and I enjoy being part of it. What is your best JCC memory? A few weeks ago, I was absent from one of the Shabbat dinners due to some other commitments. When I came for the next Shabbat dinner, an old lady came to me, held my hands gently and said something in Polish that I couldn't understand at all. Asia, a fellow volunteer, was standing next to me and translated that the old lady was saying that she missed me during my absence. I can't put that feeling into words, but it was definitely one of the most incredible moments I have had at JCC Krakow, which I am going to cherish throughout my life. In the past week, I have received messages of concern and care from many of JCC Krakow’s supporters around the world. I greatly appreciate your involvement in our community and would like to offer a few thoughts on the current political situation in Poland. As you likely already know, Poland’s parliament recently approved a bill calling for legal penalties for anyone who “publicly and against the facts” accuses the Polish people of crimes committed by Nazi Germany during World War II. As the executive director of JCC Krakow, as an Israeli, a Pole, and a Jew, I was deeply disappointed to see this bill move forward. I understand the Polish government’s desire to avoid wrongful accusation for crimes that Poles did not commit, particularly in light of significant Polish suffering during the war. Nazi Germany, not Poland, created and ran death camps on Polish land. Our community has itself directly benefited from the many Poles who saved Jews during the war. But there were Poles, as there were people throughout Europe, who exploited and killed Jews during the Holocaust. We cannot condone a law that would stifle honest reflection on the difficult elements of Poland’s past and possibly spur greater anti-Semitism in Poland. No law should prevent discussion of wrongs committed during the Holocaust, as I’m afraid this law would. To ensure the use of historically accurate terminology and popular understanding of the events of World War II, the way forward is education, not legal intervention. Though I am frustrated by this week’s political developments, the JCC is able to do what we do only because of a positive environment in which Jews are excited to embrace their roots and a large number of non-Jews, many of them JCC Krakow volunteers, who are eager to support the Jewish revival. It is easy to become caught up in fear and anxiety, but there can be no doubt that Jewish life is thriving in Poland and that many inspiring organizations are working to keep it so. JCC Krakow and its 690 members are proof. On the way up to my office this morning, I saw 15 smiling faces in FRAJDA, the JCC’s Jewish preschool. Later, I popped in to our Senior Club to chat with a group of Holocaust survivors. And in just a few minutes, I will join dozens of our local community members for Shabbat dinner in our building. It is my hope that Polish President Andrzej Duda will veto the proposed legislation, allowing for open dialogue and education about the Holocaust. And in this 10th birthday year of JCC Krakow, it is my strong belief that Jewish life will continue to thrive in Poland. Here at the JCC, we’re eager to continue on our mission to rebuild Jewish life in Krakow with you, our friends and supporters, alongside us. Meet Our Members - Agnieszka, Weronika & Anna! Agnieszka has a degree in biology but currently she works in real estate and renovation of buildings. She is interested in design, architecture, and the history of Krakow. She is a cinema aficionado, a cat person, and a traveler who likes discovering new places on her trips. She has a twin sister. Weronika, Agnieszka’s daughter, likes cooking and discovering new cuisines; she is especially fond of Asian cuisine. Just as her mother and aunt Anna, Weronika is passionate about discovering the unknown history of their family. She regularly campaigns for improving the welfare of farm animals. Her British Shorthair Sven is her most treasured friend. Anna, Agnieszka’s sister, is a clinical psychologist. She started working on clinical trials of new drugs together with her father, who was a professor of psychiatry and worked as the head of the Department and Clinic of Psychiatry in Krakow. She has been married for 26 years. She has a 22-year-old son, who currently lives and studies in England. Together with her sister, she enjoys travelling around the world as well as discovering new places in and around Krakow. She is interested in medicine, biology, and popular culture. Agnieszka and Anna were raised in an atheist family. Therefore, they are more interested in Judaism from a cultural than a religious standpoint. Before discovering their Jewish roots and becoming JCC members, they have attended various events organized by the Jewish Culture Festival in Krakow and have expressed their interest in Jewish culture. FRAJDA ECC Goes to D.C.
For the past ten days we’ve had the pleasure of participating in the 2017 Early Childhood Morim Project, organized by SOS International: Bridging Jewish Communities. This project is targeted at educators and teachers who work in Jewish nurseries and kindergartens. Delegates from three countries have been invited to join this year’s edition of the project: Poland, Bulgaria, and Romania. We, Olga Danek and Małgorzata Pustuł, representatives of JCC Krakow’s ECC „Frajda,” have been fortunate to enjoy the company of fellow educators Dalia Golda („Gradinita Gan Eden,” Bucharest, Romania) and Vanessa Cameron („Gan Balagan,” Sofia, Bolgaria). We started our trip by taking part in the Jewish Early Childhood Education Conference, organized by the Jewish Federation of Greater Washington. As many as 750 teachers gathered together at the conference. Our group attended sessions led by Mark Horowitz (Director of the Sheva Center for Innovation in Early Childhood, Jewish Education & Engagement) and Dr. Erika Brown. At the conference, we met directors and educators from various kindergartens, who invited us to visit their educational institutions during our stay. Dalia and Vanessa worked at the Beth Sholom Early Childhood Center, and we got assigned to the Sondra and Howard Bender Early Childhood Center at the Bender JCC of Greater Washington. Ora Cohen Rosenfeld, Director of the Sondra and Howard Bender Early Childhood Center, and the Center’s teacher Sandy Levine Lanes told us a lot about their work, shared their best practices, and demonstrated how the Reggio Emilia approach was being implemented at their school. The Reggio Emilia approach, which has evolved into an educational system, is a teaching method focused on preschool and primary education, based on the philosophy of Loris Malaguzzi. It was developed in Italy in 1945, spearheaded by the residents of the town Reggio Emilia, who wanted to open a school that would differ from more traditional educational institutions. According to this approach, teaching is an ever-evolving process, subject to constant changes and transformations depending on the needs and observations of teachers, parents and children. Teachers who practice this method should be open to new knowledge, and the wellbeing of children is both a starting point and a goal. We’ve been observing the work of the Center’s teachers for a week, while also working with children ourselves. Everyone has been very understanding and patient with us, answering our many questions. In addition to our work at the Center, we’ve also had the opportunity to see other nurseries and kindergartens that use the Reggio Emilia approach: we’ve been given a tour of The Rose and George Teller Preschool of Shaare Tefila (a Jewish religious kindergarten in Maryland), led by Beth Adler, and a tour of Rodef Shalom Preschool, led by its former director Fran Pfeffer. Our stay and program of events were organized by Mara Bier (Senior Education Officer for Early Childhood Education, Greater Washington area; EC Morim Project Advisor), Glynis Rosenberg Smith (Chief Operating Officer), Alan M. Reinitz (Chief Executive Officer) and Fran Pfeffer (EC Morim Project Advisor). Meet Our Volunteers - Agnieszka & Kuba! Each month, we share a blog post about the Volunteer of the Month featured in our JCC 2017 calendar. The calendar showcases the young adults, most of whom are not Jewish, who spend their time volunteering at the JCC to help us rebuild Jewish life in Krakow. This month, we introduce you to our December Volunteers, Agnieszka & Kuba! They both started out as volunteers and now are full-time staff members of the JCC. Kuba: I come from a small town in the northern part of Poland. Agnieszka: I'm originally from Krakow - as we say, a true Krakowianka. I was raised in a non-Jewish family in the Jewish district of Krakow, Kazimierz, a place filled with pre-war synagogues and traces of Jewish life and heritage. Now Kazimierz is a modern renovated district where history meets contemporary living, a trendy neighbourhood, but when I was growing up it was different, very rundown. It’s been amazing to watch these streets change. 2) Why did you decide to volunteer at the JCC? Kuba: My parents always wanted me to learn more about the world and other cultures. They taught me to treat others with honor and respect. That’s probably one of the reasons why I decided to major in Middle-Eastern studies at the Jagiellonian University. In 2014, I spent the summer in Israel interning at the Polish Embassy in Tel Aviv. Upon return, I decided to become a volunteer at the JCC because I wanted to broaden my knowledge of Jewish history and culture. Agnieszka: Growing up in Kazimierz, I became interested in Jewish history and culture. When I found out that for a thousand years Jews were a major part of Polish history, when I learned more about the Holocaust, I felt that something was missing from my history, my environment, my neighbourhood. I felt a void, I felt I would never be able to experience Jewish life here. But then I found out about the JCC, and that gave me the opportunity to meet and join the local Jewish community and help rebuild Jewish life, learn about Shabbat not only from books but by experiencing it with JCC members. And then I was lucky enough to get a job at the JCC! 3) What is your best JCC memory/the person you met/the experience you had? Kuba: Volunteering at the JCC was an excellent way to meet many interesting people, to exchange ideas and opinions with them, and hear their views on a variety of subjects. Agnieszka: My friend Olga found out about her Jewish roots when she was 12 years old. As a student, she joined the JCC, and for the first time ever she learned how to properly celebrate Pesach in accordance with Jewish tradition. Olga cleaned her house from chametz, and I was the one to whom she sold it! She’s never thought she'll be able to lead a Jewish life, and I’ve never thought I will be able to experience Jewish life in my hometown! 4) What is one of your favourite things at the JCC? Kuba: Every day spent at the JCC was a unique and interesting experience that taught me something new. That, and the community itself, are the best things about this Centre. 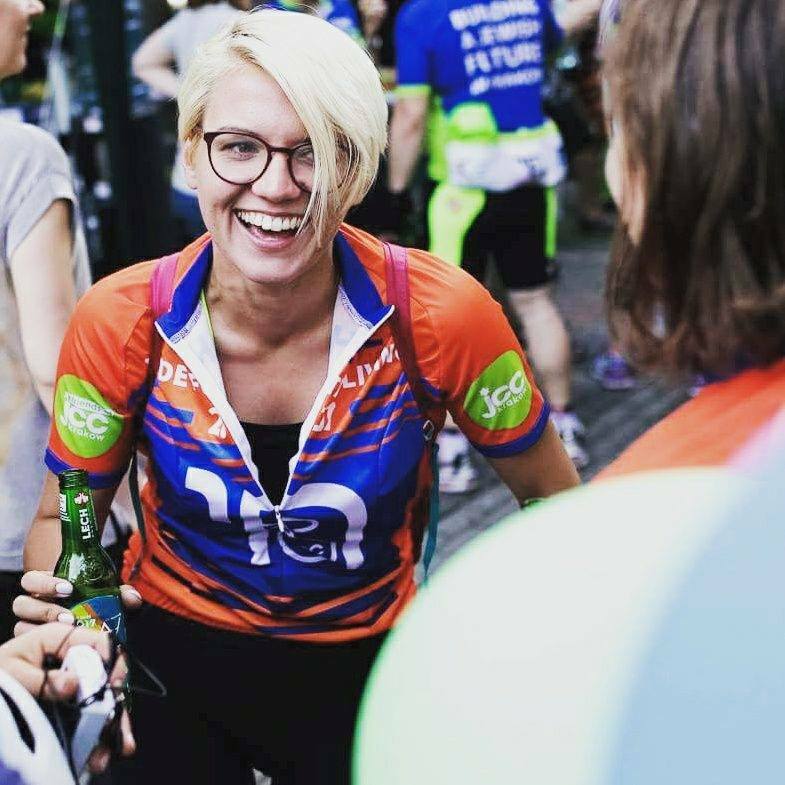 Agnieszka: Being part of JCC Krakow’s Ride For The Living has been one of the most profound and moving experiences of my life. 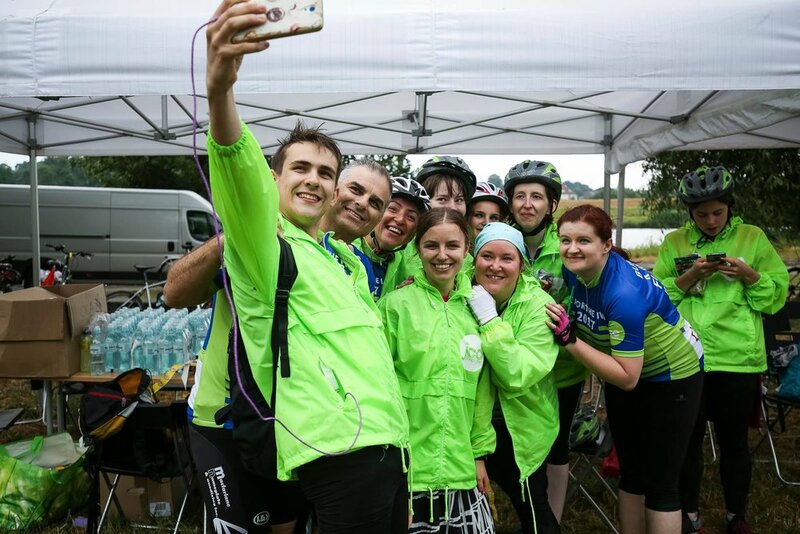 In 2017, during the 4th edition of the Ride, over 160 participants from all around the world biked 55 miles from Auschwitz-Birkenau to JCC Krakow to celebrate the revival of Jewish life in Poland. For the third year in a row, we were joined by Marcel Zielinski, a 83-year-old Holocaust Survivor who was just 10 years old at the time of Auschwitz liberation and had to walk back to Krakow searching for his family. He came back to Poland for Ride For The Living to retrace that route on a bike, this year - with his son and two granddaughters. I am still overwhelmed by all the love and support I have received during Ride For The Living, and I couldn't have been happier or felt more fulfilled. I am grateful to all Riders, my amazing JCC Krakow team, and everyone who has ever supported the Ride. I hope to see you all in 2018! Meet Our Volunteer - Ania! This month, we introduce you to our November Volunteer, Ania! Learn more about what inspired Ania to get involved with the JCC! Why did you decide to volunteer at the JCC? I decided to join the volunteer program at the JCC because I wanted to learn more about Judaism and to get to know the Jewish community of Krakow better. What is your best JCC memory/the person you met/the experience you had? I have a lot of best JCC memories, it is impossible to pick just one. Every JCC memory is among my best. Since I became a volunteer at the JCC, I have met so many wonderful people here, people who have taught me a lot. We’re all one big family here, and it is this unique atmosphere that made me continue with the program for another year. What is one of your favourite things at the JCC? This special atmosphere at the JCC - I like it the best. Everyone is so friendly, and helpful, and nice. I like to work at the reception, too, because it gives me the opportunity to talk to people from all over the world. JCC Krakow celebrates opening of Early Childhood Center "Frajda"
ceremony officially marked the first time in over half a century that a pluralistic Jewish nursery school has opened its doors in Krakow. Frajda was made possible through the generous lead grant of Eric and Erica Schwartz of New York City, who spoke at the ceremony about the revival of Jewish life. “The preschool years are the ideal time for learning about Jewish culture, values, and traditions. We are so pleased to make it possible for Krakow’s Jewish families to send their children to a school that focuses on providing this foundation for the youngest members of the community,” Erica Schwartz said. Polish Undersecretary of State Wojciech Kolarski, President of the World Jewish Congress Ambassador Ronald S. Lauder, and Elizabeth Szancer, donor of Frajda’s Szancer Family Reading Corner, provided remarks to be read in their absence. consultation with leading Jewish early childhood education experts from Poland, the United States, and Israel, Frajda’s state-of-the art facility can serve up to 22 students. Three dedicated teachers will deliver instruction this year, and the JCC will provide transportation to students from across the city. The outdoor Taube Family Playground and the Shana Penn Garden to be opened in Spring 2018 will be sponsored by Taube Philanthropies and will augment Frajda’s activities. Frajda’s annual security needs will be underwritten by The Ronald S. Lauder Foundation. Frajda’s opening would not have been possible without the contributions of Jeff and Janet Beck, Alan and Cindy Golman, Susan Lerner and Michael Roffer, Sam and Gina Rosenberg, Judy Wolf-Nevid, Michelle Ores, Elizabeth Szancer, Agi Legutko, and the entire Friends of JCC Krakow board. The JCC is immeasurably grateful to Eric and Erica Schwartz, as well as to these friends and supporters from around the world whose love and dedication enabled the establishment of Frajda. Their enthusiastic support will help future generations of Jewish Poles to connect with Jewish traditions, holidays, history, and values from the day they are born and to celebrate their Polish Jewish identities. established itself as the focal point of Jewish life for Krakow’s residents, as well as for thousands of visitors from around Poland and the world every month. Today, the JCC has over 650 active Jewish members, including 70 Holocaust survivors. Meet Our Volunteer - Dominika! 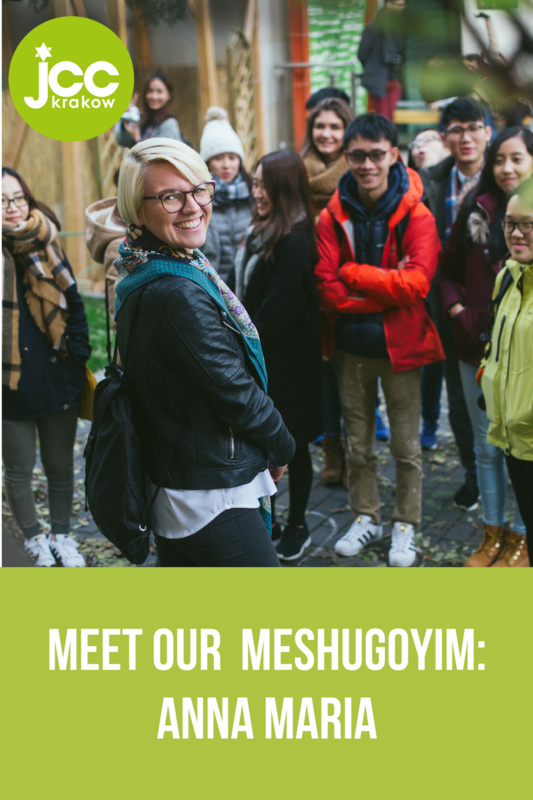 Each month we will share a blog post about the Volunteer of the Month featured in our JCC 2017 calendar which features the young adults, most of whom are not Jewish who spend their time volunteering at the JCC to help us rebuild Jewish life in Krakow. I currently live and study in Krakow, but I was born in Tarnów. I became interested in Jewish culture when I was still an elementary school student. This was due in no small part to the influence of my aunt Ania, who was a Jewish studies major at the Jagiellonian University. Every time she came back to Tarnów, her hometown, she would share with us what she had learned. She was also teaching me basic Yiddish. I was fascinated with the object of her studies, with Jewish history, with the language. My senior year of high school I started attending a preparation course in drawing because I wanted to enroll at the Academy of Fine Arts. The course was taught in Krakow on Fridays and Saturdays. Therefore, on weekends I would stay at my aunt Ania’s place in Krakow. One time, after I had completed my studies for the day, I went to the JCC to see my aunt and join her for Shabbat dinner. That was the day when my fascination with Jewish culture began in earnest. I had been to Shabbat dinners before, but nevertheless, I was amazed and surprised by the atmosphere at that Shabbat dinner at the JCC. So I kept coming back. One night there weren’t enough volunteers to help out, so my aunt asked me if I would lend a hand. Obviously, I agreed right away, I was happy to be able to contribute in any way I could. Then, I started to help more often and I felt my connection with the JCC grow stronger. At some point I realized that this place had become part of my life, and therefore, I decided to be join the volunteer program. I could probably write a book about my memories from all of the years I spent at the JCC. I have met so many wonderful people there, people who became my friends and family. Some of my favorite moments were my first Shabbat dinner with the community, my first time participating in Ride For The Living, and the first group of tourists I brought to the JCC courtyard on a walking tour. The best thing about being a member of the JCC family is that I know there are many more wonderful memories to be made! What is one of your favorite things at the JCC? My favorite thing at the JCC? The people I’ve met here. Thanks to them, I want to spend as much time here as I can every day, learning new things about Jewish history and culture. Meet Our Volunteer - Anna Maria! I come from a small town called Myszków, located close to Krakow. I moved to Krakow almost 9 years ago, and since then this beautiful city has become my home. There were so many reasons why I decided to come to the JCC. 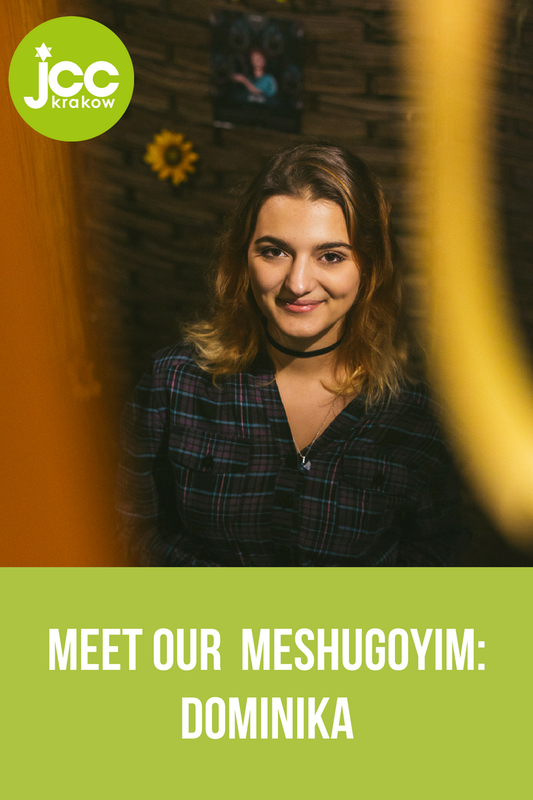 I wanted to try something new, I wanted to pursue my interest in Jewish culture and history, and I wanted to get more experience and gain new skills that would help me with finding a job after graduating from university. Prior to becoming a volunteer, I had visited the JCC a couple of times and found the atmosphere there to be simply amazing. People were so friendly, they were smiling all the time, and happily chatting with each other. “This is a perfect place for me,” I thought... and I wasn't wrong! The best thing about our JCC is its great atmosphere. Everyone feels good and at home here! It doesn't matter if you come and talk to our seniors in the Senior Club, spend your time in the office, or just hanging out on the orange couch by the reception desk chatting with whoever comes in, you always feel like you’re a part of the community. The atmosphere at JCC Krakow is one of freedom, comfort, and hope! Meet Our Volunteer - Agnieszka! I’m actually originally from Krakow. I first decided to join the volunteer program at JCC Krakow to expand my knowledge of Judaism and Jewish traditions. But then I discovered that finding out more about the Jewish presence in the city was a great way to learn more about the history of Krakow and, surprisingly, about Polish culture as well. This is, hands down, the trip to Israel with the members of the JCC Senior Club. It was a very emotional and moving experience. I look fondly on the time spent on that trip with our seniors, many of them Holocaust survivors, and I will always remember the stories they shared with us and the fun we had discovering Israel together. I enjoy helping out at the Senior Club. Talking to our seniors is an opportunity to see history come alive. We have so much to learn from them. I wouldn’t be amiss if I said that in some way they are an inspiration for us, the young generation. Meet Our Volunteers - Ewa & Julia! I was born and grew up in Krakow. For as long as I remember, I have been interested in Jewish culture. One day, I realized it was my calling to contribute to the revival of Jewish life in Krakow, and what better place was there to start than the JCC? I applied for the volunteer program, I got accepted, and I stayed. Being part of the Jewish revival makes me happy and inspires me every day. Thanks to my volunteer service at the JCC, I have learned many interesting things that I would have never learned anywhere else. It is tough for me to choose only one, but what I really enjoy is helping out at Shabbat dinners and during Jewish holidays as well as talking to the members of the JCC Senior club - they have a lot of surprising and inspirational stories to share. What I love the most about the JCC is the atmosphere, which is incredible! Because of the atmosphere, I usually linger in the JCC building long after my shift is done, just hanging out and talking to people. I have a feeling that the place itself attracts amazing people, who build the community and create a new, more beautiful Krakow. I owe a lot to the JCC and I will never forget the time I have spent here. I was born and raised in Krakow. Prior to making the decision to join the JCC volunteer program and become part of this incredible community, I had participated in many workshops and activities organized by the JCC and taken part in the Jewish Culture Festival. I was encouraged to join the volunteer program at the JCC by my sister Ewa who had already been a volunteer there for quite some time. I thought it was a great - and productive! - way to spend my summer holidays. I started by helping during the Jewish Culture Festival and as a result, I stayed on at the JCC for the fall semester. I guess, once you join the JCC’s team of volunteers, you’re hooked on the experience and you don’t ever want to leave. My best JCC memory is the so-called Silent Disco, which took place during the Festival in 2016 in the JCC’s backyard. We all danced, laughed and partied with earplugs in our ears. It was an amazing experience and an unforgettable party. The thing I like the most about the JCC is that it is a place that is open to everyone. Literally, everyone. I always feel good and comfortable when I am here, because this place draws in so many interesting and diverse people. Thanks to them, the JCC is full of life. Everyday you can meet here someone with an incredible story, therefore every time I am here I learn something new and expand my horizons. Because of the atmosphere at the JCC, I have many nice memories and I always want to come back here. Many of you who have joined us over the years at JCC Krakow for a Shabbat dinner had the good fortune to hear a sweet older gentleman sing a few songs in Yiddish at the end of the meal. Emanuel Elbinger, "Mundek," Holocaust survivor, the last Krakowian born native speaker of Yiddish still living in Krakow, passed away peacefully this past Friday at the age of 86. You can read more about his life in the below article. Mundek was born in Krakow in 1931 and lived in Nowe Brzesko (35km outside of Krakow) with his family until September 1942 when his family was divided and hidden by Polish families. Before the war, his parents owned a textile factory and hid some of their textiles throughout Krakow in case they needed it for trade. His youngest sister was taken out of hiding and sent to a deportation center and his grandmother was killed among many other elders before the deportation. Mundek’s mother and younger sister were initially hidden by a priest, but later on joined Mundek and his father in the attic of a farmer’s house. His family soon realized they were no longer safe there and left to seek shelter at another house. Mundek and his mother would dress up in peasant women clothing to retrieve the textiles that were hidden in exchange for their safety at the house. On one of his trips, Mundek’s former classmates recognized him and Mundek ran towards the countryside in fear someone would hear them yell “Jew”. One evening his mother went out to get food for the family and never returned. After the liberation, Mundek, his father, and younger sister went back to Nowe Brzesko where his father placed them at a Jewish orphanage in hopes they would get the help they needed. Shortly after, his father passed away from Tuberculosis. Mundek graduated with an Engineering degree in 1954 and worked in the field until retirement. Mundek was an active JCC Krakow member ever since the Center opened in 2008 and has joined us for our weekly Friday night community Shabba dinners, where he often shared a couple of his favourite Yiddish songs with everyone. May his memory be a blessing and may we all continue to sing on Shabbat with the energy and love that he did. Can't come to Poland to take part in our 55-mile bike ride from Auschwitz to JCC Krakow? Join a satellite Ride For The Living event in your city! Thanks to our partnership with the JCC Association of North America, JCCs across the U.S. are organizing dedicated spin classes to raise awareness about Ride For The Living. This can be your opportunity to support our cause and share in this unique experience. Check out the full list of events here and sign up today! Meet Our Volunteers: Justyna, Magda & Sylwia! This month we introduce to you our June Volunteers, Justyna, Magda & Sylwia! They all participated in the 2016 Ride For The Living and this year, Magda & Sylwia will take on the role as one of our marshals. They will know the route inside and out and our Riders can rely on them for help and guidance! I currently live in Krakow, but originally I am from a small town in Silesia. I wanted to gain an inside perspective on Jewish culture and practices. Being a volunteer at the JCC gives you all kinds of opportunities to get involved in Jewish life. What is your best JCC experience? If I had to choose just one, it would be last year’s Ride For The Living. Specifically, that final moment when we rode through the gates of the JCC at the end of our journey, cheered on and greeted by our community. That was very emotional. The best thing about JCC Krakow is that it has become my second family, my home away from home. Being here always puts a smile on my face. I'm from Krakow, born and raised. I enjoy helping people, that’s why I volunteer at several organizations. Volunteering is an important part of my life. It is a perfect opportunity to meet new people and learn about different aspects of life. Moreover, through volunteering I am able to get to know myself better, too. At the JCC, I make new friends and meet interesting people; I familiarize myself with Jewish culture. Every experience at the JCC is wonderful, memorable and unique! The visitors! I like it when guests of our city find the time to visit the JCC, discover Krakow through the prism of the city’s Jewish presence, and learn our story. When I was in high school, I went to Jerusalem on a student exchange program, which the JCC helped organize. It was then when I learned about the JCC volunteer program and decided to join. JCC Krakow seemed like a very open, friendly, vibrant place with many opportunities, and I really wanted to be a part of it. My best JCC memory was meeting Marcel Zielinski, a Holocaust survivor. He currently lives in Canada but has joined us for Ride For The Living twice already. It was an unforgettable experience to ride together with him in 2016 RFTL, and I felt honored that he wanted to share his story with me. I have two favorite things at the JCC. First, Shabbat dinners when the whole community can gather together after a busy week, rest, celebrate, and rejoice. Second, studying the Torah with the Rabbi every Saturday. I am happy to see that my colleagues - young Jews - have an opportunity to deepen their knowledge of the Torah as well as of their culture and religion. We, at JCC Krakow, would like to extend a warm welcome to Rabbi George Schlesinger, who is a Taube Visiting Fellow serving the Krakow community for the month of May, hosted by the Taube Center for the Renewal of Jewish Life in Poland Foundation and sponsored by the Taube Foundation for Jewish Life & Culture. Rabbi Schlesinger’s visit to Krakow started with a Shabbat dinner at the JCC last week, where he met with the local Jewish community. We are happy and honored to host Rabbi Schlesinger and we believe that the time he’ll spend in Krakow will be of great value and benefit to our community. Previously, Rabbi Schlesinger visited Poland with the North California Board of Rabbis Mission with Taube Jewish Heritage Tours. This time, Rabbi Schlesinger will be working closely with the JCC, Galicia Jewish Museum, Jewish Culture Festival and the Institute of Jewish Studies at Jagiellonian University for a month. Rabbi Schlesinger’s presence will have a profound impact on locals by educating them about Judaism and its culture and traditions. He will be delivering lectures, hosting meetings, leading services, and helping with Jewish knowledge and advice. Rabbi Schlesinger was ordained at the Jewish Theological Seminary in New York. He has served as a Conservative congregational rabbi for the last 40 years. Throughout his career, he has created numerous programs and classes, providing for the educational, spiritual, and ritual needs of the members of his congregation. Now retired, Rabbi Schlesinger continues to serve the Jewish community by teaching students, officiating at weddings and funerals, and volunteering at his synagogue as a Torah and Megillah reader, Ba’al Tefillah, and lecturer. Rabbi Schlesinger also loves music and plays piano, harp, and guitar. He is also an avid long-distance cyclist: he has bicycled across the United States both west to east and south to north! We wish Rabbi Schlesinger a pleasant and productive time in Krakow, and we are excited to support him here in all his endeavors. In October 2016, a delegation from the North California Board of Rabbis came on a mission to Poland with Taube Jewish Heritage Tours. Following that trip, in response to the rabbis’ mounting interest in returning to Poland, the Taube Visiting Fellows program was launched with the Taube Center for the Renewal of Jewish Life in Poland. The Taube Visiting Fellows program brings San Francisco Bay Area rabbis, educators, and community organizers to different cities in Poland (1-3 per year) for a 4-week residency. During their residency, each fellow works with the local Jewish communities seeking to strengthen their infrastructures and effectiveness, to expand their knowledge of Jewish traditions, and to encourage their engagement in Jewish life. The Fellowship program is supported by the Taube Foundation for Jewish Life & Culture, the Jewish Community Federation of the San Francisco Bay Area, and the Northern California Board of Rabbis. I grew up in the Silesia region but I currently live and study in Krakow. My adventure with the JCC started two years ago. The JCC was looking for volunteers to help with 7@nite - Night of the Synagogues. I found out about the event on Facebook and decided to participate. I thought I’d just stay only for that one event, but the atmosphere, the people and the opportunity to learn about Jewish culture made me change my mind. So I stayed longer and continued to support other initiatives at the JCC. My best JCC memory is my first Shabbat dinner. We had it outside, in the JCC courtyard; there were candles, multi-coloured lamps, we sang songs. But of course it’s not my only good memory at the JCC! The JCC provides a lot of opportunities, both to members and volunteers. There is something for everyone here, I think. I am originally from Krakow and have been living here my whole life. I've been a volunteer here for four years, so it's not easy to choose just one. But I think that the best thing is having the opportunity to to speak to many people from all over the world. I spend many hours at reception, and it has helped me to become less shy, and now I'm not as shy around people as I used to be. But the most precious thing is is that I can listen to the stories of people who come to the JCC and why it is important to them. I am also grateful to have become good friends with the other volunteers. It's really hard to choose. There are many factors. First of all, the people - they are nice and helpful. Second, I like helping during Shabbat dinners and Jewish holidays. At these events I have an opportunity to be with JCC members, as well as learn about Jewish culture and traditions. Every day I get to learn something new. Each month starting in January, we will share a blog post about the Volunteer of the Month featured in our JCC 2017 calendar, which is dedicated to the young adults who spend their time volunteering at the JCC to help us rebuild Jewish life in Krakow. I'm from a very small town in West Poland called Żagań. I wanted to learn more about Jewish culture and thought I could only do that by reading books. When I came to the JCC I found out that I could be a volunteer and learn about Jewish life today by actually being involved with the Jewish community! I talk to the Survivors, people my age who just found out they are Jewish, and with visitors from around the world. Every day is different. Every day gives you opportunity to meet new people and that's amazing. But I remember one special situation in 2015 when a man saw the sign outside the JCC, "Stop by and say hi" and so he did. After a short conversation about the JCC, I asked him how does he feel being in Krakow and if he likes it. He said yes, especially because his father is from Poland. We started to talk about his father and it turned out that he was Joseph Bialowitz, a son of Philip Bialowitz - one of the survivors from the uprising in the Sobibor camp. I couldn't believe that the son of a man that I've read so many books about was standing in front of me! I was amazed and surprised that this sign "Stop by and say hi" has that power and not only changed my life but continues to change the life of so many others. Lila and other JCC volunteers talking about their experience at the JCC on Radio Krakow. I enjoy that you can be yourself and that you are surrounded by so many amazing people. Every of them are unique, beautiful, creative, and they support you no matter what. Being at the JCC I've learned how to love myself and how to share this love with others, how to be strong and never give up, and how to enjoy life - I'm very grateful for all of that. Lila and JCC Krakow members and volunteers taking part in the Warsaw Ghetto Uprising commemoration. KRAKOW, Poland (JTA) — The JCC of Krakow has received a $500,000 grant from the New York City-based Eric and Erica Schwartz Family Foundation. The funds will support the creation of an Early Childhood Center at JCC Krakow, located in Kazimierz, the heart of the city’s Jewish district. It will be the first time that a pluralistic Jewish nursery school will be open in Krakow since before World War II. The school is scheduled to open in fall 2017, with a soft opening earlier. The Early Childhood Center, to be named “Frajda” meaning “joy” in both Yiddish and Polish, will be a Jewish pluralistic nursery school serving the growing number of young Jewish families in Kraków. Frajda will provide a comprehensive Jewish curriculum focusing on the holidays, history, and Jewish identity. The newly designed, state-of-the-art space is being created in consultation with leading Jewish early childhood experts from Poland, the United States, and Israel. “The preschool years are the ideal time for learning about Jewish culture, values, and traditions. We are so pleased to make it possible for Kraków’s Jewish families to send their children to a school that will focus on providing this foundation for the youngest members of the community,” said Erica Schwartz in a statement. “Jewish life is once again thriving in Kraków and the Schwartz family believes that this community deserves a future and that Jewish education is an integral part of that future,” said Jonathan Ornstein, executive director of JCC Krakow. JCC Krakow also received support of The Ronald S. Lauder Foundation to underwrite the annual security needs of Frajda. Lauder was the first philanthropist to commit serious resources to rebuilding Jewish life in Poland after 1990, including restoration efforts in the Kazimierz district and its seven historic synagogues, as well as numerous educational initiatives serving the Jewish population of Kraków. His foundation today is the largest provider of Jewish education in Poland through the Lauder Morasha School in Warsaw and the Lauder E-Learning School for Jewish children in small communities across the country. children playing and learning on the streets of Kazimierz would be heard once again". JCC Krakow was opened in April 2008 by The Prince of Wales. It has quickly established itself as the focal point of Jewish life for the city’s residents, as well as thousands of visitors from around Poland and the world every month. Today it has over 600 active Jewish members, including 75 Holocaust survivors. more information, please visit www.jcckrakow.org or www.friendsofjcckrakow.org.